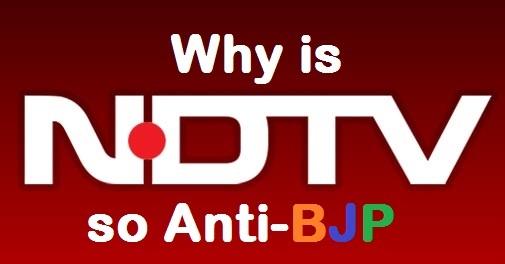 Opinion: Why is NDTV so Anti-BJP? 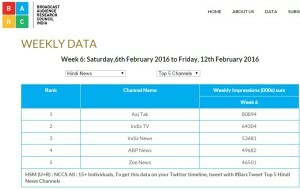 Why is NDTV so Anti-BJP ? UPDATE: With recent developments of IT raids being conducted at the properties of Mr. Pranoy Roy, this article acts as a factual proof in proving the political affiliations of NDTV. Must Read & Share. On 19th February 2016, a ‘Kaun Jaat Ho’ marka journalist came in limelight for his black-screen show that claimed to unveil the dark side of Journalism in India. He talked about various loopholes and deficiencies in the present times, but missed the core of it, which I am going to talk about in this article.To start with, let me first explain as to what compelled Mr. Ravish Kumar to project black screens on NDTV India’s Prime Time. 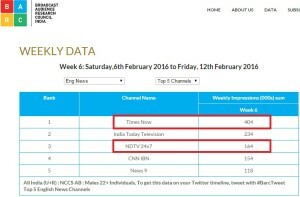 NDTV 24X7 (the English news channel of NDTV Group) stands third with 60% less viewership in comparison to Times Now. Talking about this week’s prime-time scorecard, Yashwant Deshmukh (a renowned psephologist) revealed on his twitter handle that Times Now received 82% of the total viewership with NDTV receiving only 3% of it. 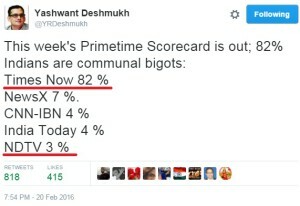 Using satirical tone, Yashwant snubs #Presstitutes by saying that 82% Indian are communal bigots. Telecasting black screens was hence a way to catch TRP, but in vain. This was just a small sneak-peek into the way media is hand-in-glove with various political parties and then Ravish says “TV Bimaar hai”, “Baagon Mein Bahar Hai”. Ironic. Great thanks for posting! btw are there feeds to your blog? Id like to add them to my reader. Sure. Feel free to subscribe to our news feed.